Picked up a couple of flyers at Taringa rail station ..
Transport Minister Annastacia Palaszczuk today announced Taringa train station would receive a $1.3 million renovation to improve facilities for commuters. Ms Palaszczuk said construction was starting at the station this month. 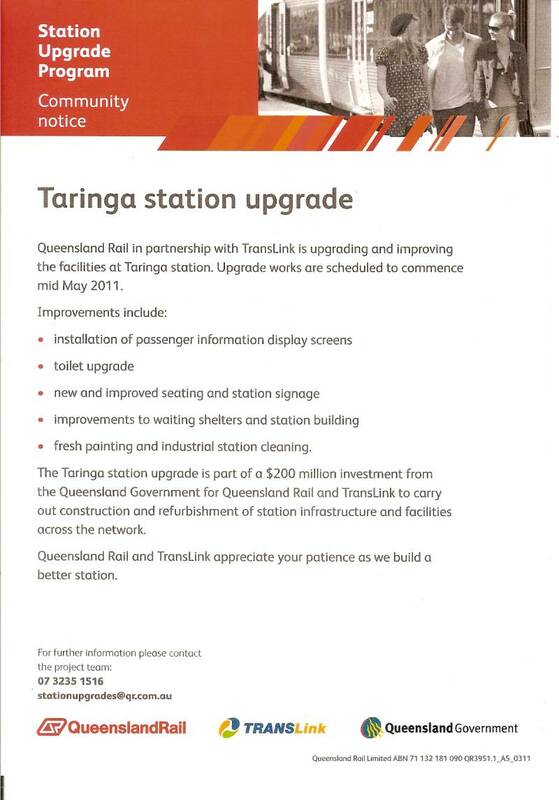 "Renovation work to Taringa Station will include toilet upgrades, new and improved seating and signage, new roof, painting, landscaping, new Passenger Information Display Screens and scenic artwork," Ms Palaszczuk said. "The new-look station is part of the State Government's $200 million Station Upgrade Program which is improving almost one-third of train stations across South East Queensland. "The program is one of the biggest upgrades since services began in the 1860s and will give stations a fresh new look and improved facilities." Ms Palaszczuk said safety at Taringa and surrounding stations had also been improved recently with the installation of an upgraded CCTV security system at Taringa, Chelmer, Graceville, Sherwood and Auchenflower. "We're investing in the safety and security of local customers, with a new CCTV system installed at five local stations this year as part of a $3.3 million CCTV upgrade at 47 stations," she said. "The new technology will provide better detection and monitoring of our local station, and will improve the reliability of data which can be used to assist in police investigations." Ms Palaszczuk said this was in addition to a number of other security initiatives recently announced for the Ipswich line, including a partnership with Crime Stoppers, police mounted patrols and mobile security dogs. 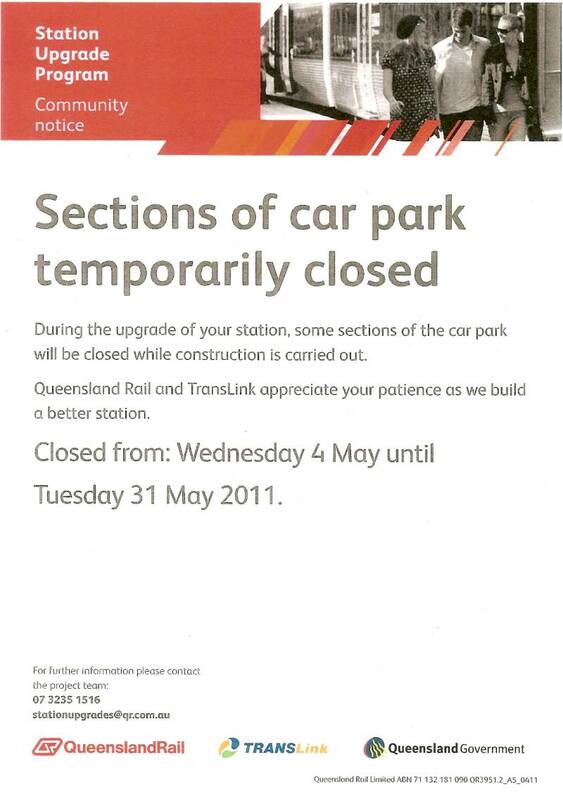 Queensland Rail and TransLink will work with the construction teams to minimise disruptions for customers during the station enhancement works. For further details on public transport, visit the TransLink website www.translink.com.au or phone the Call Centre on 13 12 30. I don't suppose they intend fixing the wafer-thin platforms, their surface treatment or heights? No? That's OK, there's a pretty mural to look at. I agree, Taringa needs much more than $1.3m to fix its problems! Perhaps they could build an entirely new station near it then decommission Taringa, rather than some lengthy and painful upgrade?? From the Westside News click here! A TRANSPORT lobby group says not enough is being done to improve disabled access to Taringa railway station despite the State Government’s commitment to a $1.3 million upgrade. Spokesman for commuter advocacy group Rail Back on Track, Robert Dow, welcomed the upgrade announcement earlier this month but said a major upgrade was needed. “The minor upgrade is useful and all a good thing but the basic issue is that the station can’t be accessed by disabled people,” he said. 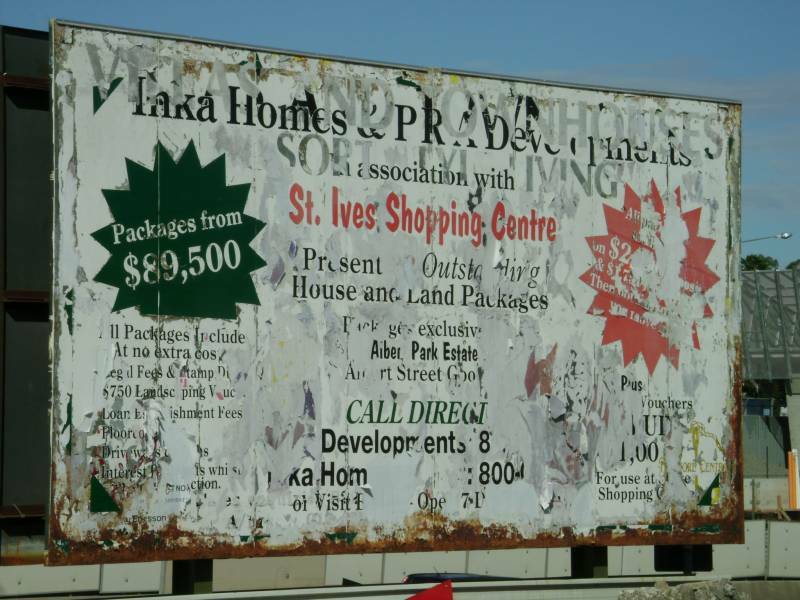 “Taringa has on the census one of the highest public transport usage rates outside the CBD in southeast Queensland,” Mr Dow said. Indooroopilly MP Scott Emerson said he had spent two years pushing the State Government to commit to the minor upgrade. “It is still unacceptable that (this) upgrade (doesn’t) include a lift to improve access for those with a disability or others including parents with prams,” he said. Bus services provide a viable (better outside peak) alternative for most of the disabled and people with prams, so long as you don't need to cross the train line to reach them. Also getting from Rockeby Tce to the I/B stop is a problem. Another problem is that QSBS B isn't accessible by the disabled. Taringa rail station missed the bus ... remember this Taringa, possible TOD? This TOD seems to have died, along with a few others as well, although something significant might happen one day at Taringa ..
You could spend a lot of money on this station and still not make it DDA accessible, has anyone bothered to look at the topography around there?! You could but you wouldn't do it unless you did. There is a legal requirement to do it. Depending on wether the platforms on the mains are kept or not simplies things a little. In any case simply widen the cutting on the main down, side platform, island, then another side. This simplifies the necessary ramps and lifts. Alternate is the just a new island on the subs. What I'm saying, is how do you gain access to the north? you would need at the very least a high elevator and a bridge from Moggill Rd/Morrow St. It is going to be big ugly and expensive! Not really, I walk along there regularly. The exit north from the station concourse is along a walkway level with the road. The real issue is getting up from the platform to the concourse It would be a challenge but not any more so than say Buranda bus station and elsewhere.